Queen... Our most affordable accommodation, the Capital Room features a new 32` television, a ceiling fan and an individually controlled AC unit and a new leather headboard, for serious relaxing once the day is done. The second floor room has three operable windows, with views to the Courthouse beyond, and the horse carriages passing below. It is decorated in muted yellow/grey texture with brown accents, and, as with the rest of the house, original plank flooring. As with all of the guest rooms, the mattress, duvet and pillows are all new. The Capital washroom is located directly across the hall from the bedroom, with design clues to match, an oversized shower, and a new sink in an antique piece. Queen... One of the few rooms in the Old Town that is located on a main floor, Villeneuve is steps away from the veranda, living area and dining room, and is a beautiful room for those who like to get up early, stay up late, or simply wish to avoid stairs. It is finished in layers of creams highlighted by a dark background, is a combination of traditional and modern, with a similar mix of hard metal and soft furnishings. In addition to the queen bed, the extra seating provides a great place for watching the television, or cuddling with a novel. The wall of library shelves are filled with books for your pleasure. The three operable windows, overlooking the veranda and front garden, allow a lovely breeze, and refreshments are always available in the room to make your comfort complete. 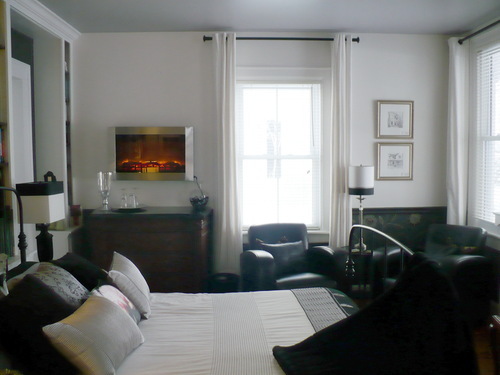 This room is a true delight, and a favourite among our returning guests. The modern ensuite in Villeneuve is decorated in soft whites, mottled blacks and taupey greys. The oversized walk in shower is five feet long,with a rain shower overhead, an adjustable height hand held shower, and a marble surround. An operable window allows fresh air yet provides complete privacy. Queen... 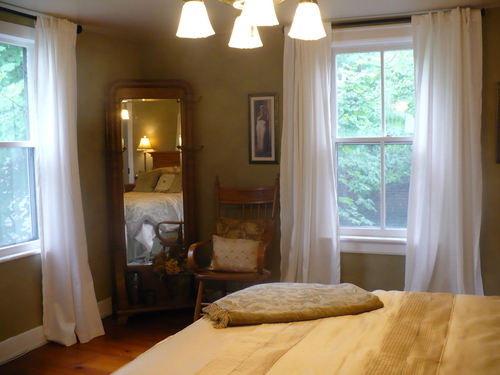 The Newark Room is our premium room, warm in a variety of rust, sage and caramel tones. Soft colours blend perfectly with the leaves outside your windows. 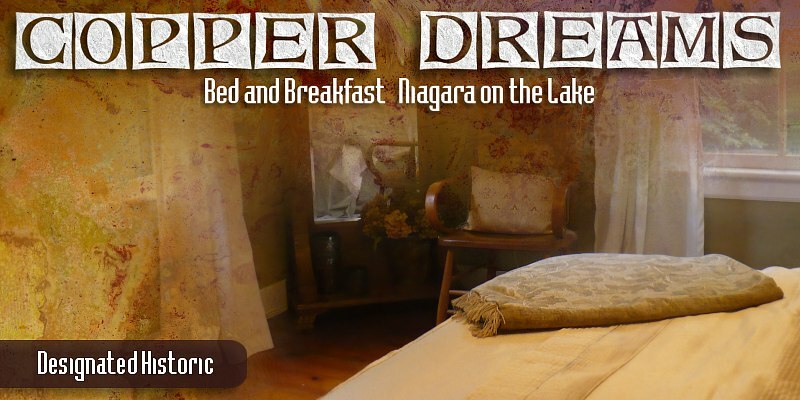 This wonderful room has a delightful corner fireplace, and three large windows that overlook the front garden and Niagara-on-the-Lake's historic Court House (which houses one of the Shaw theatres). The windows are all fully operable, which offer gorgeous views, and allow a fresh breeze into the room. The oversized ensuite (once a bedroom)in Newark has both a corner soaking tub perfect for two (and comes with bubble bath), and a separate walk in glass shower surrounded by warm honey-toned marble. 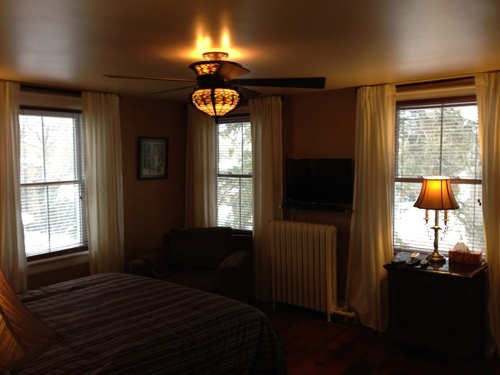 This private bath also offers two openable windows, with views of the treetops and sunsets.